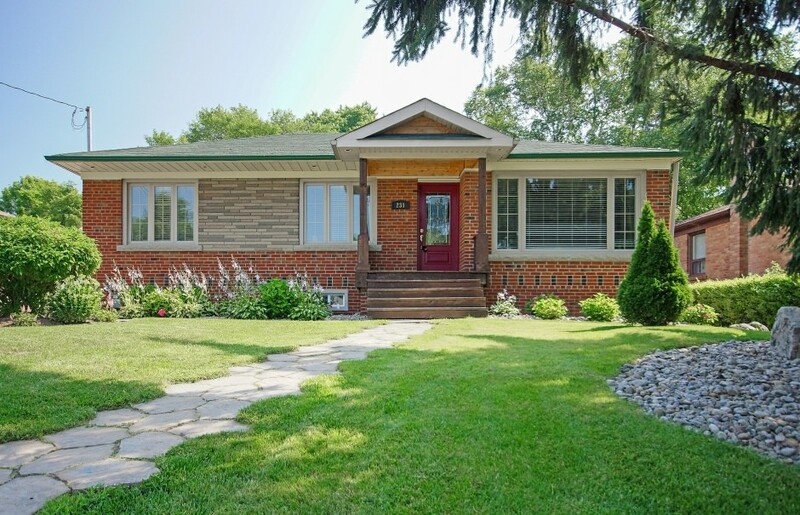 Stylish, warm and inviting, beautifully decorated 2.1 bedrooms / 3 bath bungalow nestled on a lovely 60 ft x 141 ft (RO3) lot in a quiet residential West Oakville neighbourhood. Funky design choices combine to create a refreshingly different and welcoming home, with that perfect touch of charm and class. This a great lifestyle buy — the perfect "move in" opportunity for empty nesters or young professionals. Features include hand-scraped oak hardwood flooring, and upgraded broadloom. Premium millwork includes upgraded door and window casings, baseboards and crown, plus sleek 5-panel doors with brushed nickel hardware. The master ensuite is reminiscent of a boutique hotel with seamless glass shower and track drain plus heated flooring. Includes Victoria & Albert volcanic ash soaker tub and matching basins plus modern chrome Riobel bathroom fixtures and contemporary stainless steel multi feature shower column with illuminated rain head. The master bedroom features built-in custom designed contemporary armoires. The furnace and air conditioning have recently been replaced. Other features include pot lighting and built-in speakers in the living room, master bedroom and master ensuite. The spacious two tiered rear deck boasts a peaceful, shady gazebo and is a great place to entertain and unwind. This hot, rapidly transitioning neighbourhood is presently in high demand due to the quiet treed streets and mature 60 ft lots. If you are considering an investment opportunity for development potential, this is a unique chance for someone looking for an income property and presents an attractive leasing option for an executive tenant. Don't wait as this is one of the last remaining centrally located Oakville neighbourhoods to experience gentrification. Strategically located near downtown Oakville and just a short walk to Appleby College, St. Thomas Aquinas Catholic Secondary School, Thomas A. Blakelock High School, Morden Road Elementary School, and St. James Catholic Elementary School. Only 300 yards from your morning swim or workout at the fabulous Peter Gilgan YMCA. Note: Seller is a Registered Real Estate Salesperson.